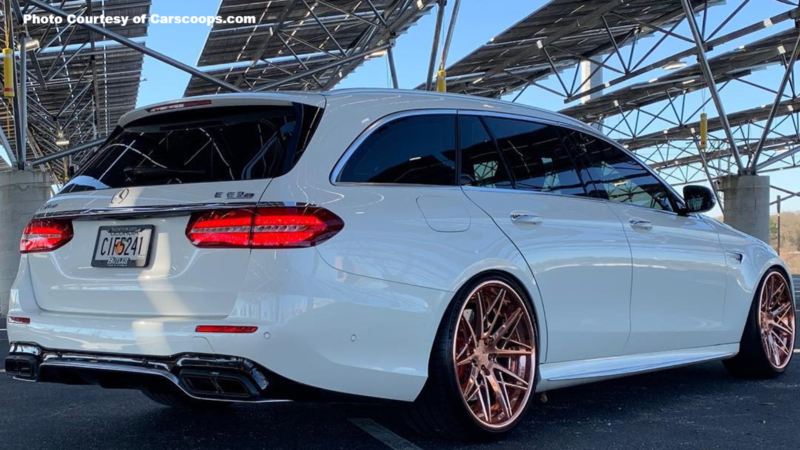 Slideshow: This revamped 813hp Mercedes AMG E63 S Estate is probably the fastest wagon in the world. The AMG E63 S Estate is a car that redefines what it truly means to be a station wagon. Engineers have combined exemplary performance stats with practicality to deliver one of the fastest estates money can buy. Just like its saloon version, it's available in two: a regular E63 and an E63 S. Both can be upgraded to the owner's liking. The most special attribute is that it takes away the boredom of owning a station wagon. You can drop your kids to school in it and turn its tires to smoke right afterward. The 4.0-liter V8 has a twin-turbo. This optimizes the gas cycle and reduces exhaust gas back pressure. In addition, the engine churns out 604 hp and 627 lb-ft of torque. An integrated fully variable all-wheel-drive system and a 9-speed dual-clutch transmission allow the AMG E63 S Estate to get from 0 to 60 mph in just 3.5 seconds and reach a top speed of 155 mph. This sets a new record in the station wagon segment. At 627 lb-ft of torque, which is achieved at an engine speed of between 2,500 and 4500 rpm, this wagon also reaches a new high. There's an additional standard cylinder deactivation system that makes the engine more efficient. >>Join the conversation about this E63 right here in MBWorld forum. The all-wheel-drive system in the AMG E63 Estate is engineered with torque distribution in mind. This enables the car to achieve maximum traction on the surface. The 9-speed transmission now comes with new hardware and software. Shift times are extremely short. A wet clutch comes in place of the torque converter reducing weight and optimizing the overall response. The AMG suspension now features a full-support multi-chamber air suspension that delivers maximum chamber stability, steering precision, handling safety, and high levels of driving dynamics. For one Mercedes AMG E63 Estate owner, all that power wasn't enough. 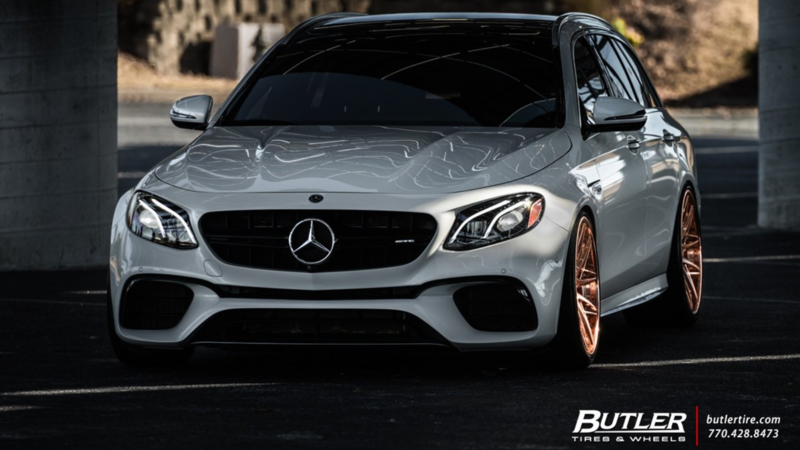 He turned to RENNtech, one of the best Mercedes-Benz tuning companies in the world. The tuning studio installed a new Akrapovic exhaust system and updated the intake and turbochargers. The result was a station wagon that could produce up to 813 hp and 738 lb-ft of torque. 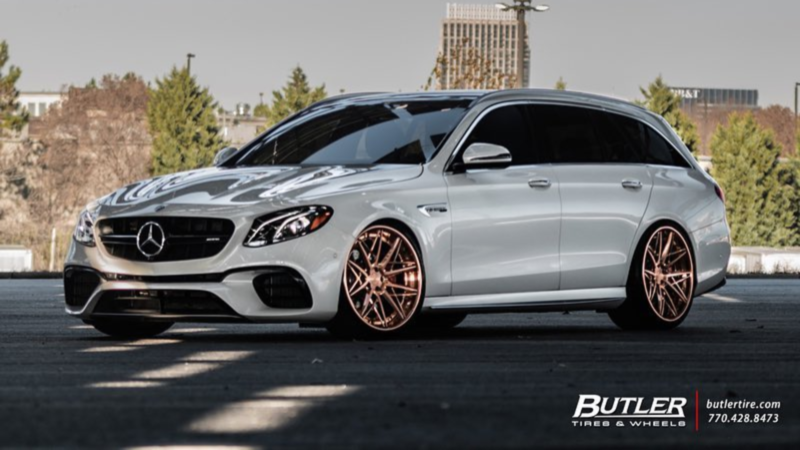 New 21-inch copper wheels from AG Luxury Wheels and a revamped suspension were also included, allowing the car to get from 0-60mph in just 3 seconds. The AMG E63 Estate has plenty of head and legroom for its passengers. It also tags along with a vast boot that can hold up to 670 liters. When the seats are folded, the numbers jump up to 1,820 liters. The interior upholstery is finished with Nappa leather that mixes well with the stainless-steel sports pedals and fine aluminum trim elements. 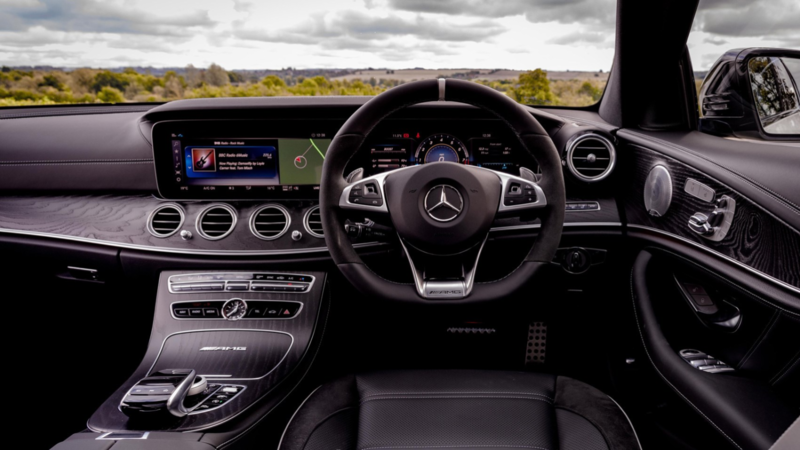 There's an AMG instrument cluster that delivers all the important information to the driver within his field of vision. Drivers have three unique display designs to choose from: Progressive, Sport, and Classic. Amidst the plush finishes are bolstered sport seats that bring out the muscular stance of the Estate. 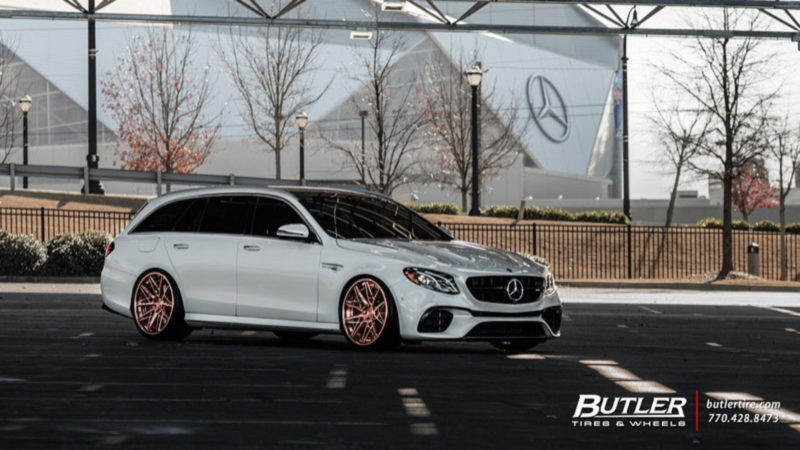 What distinguishes the E63 S Estate from the regular E63 are its bigger 21-inch wheels and new engine mounts that adjust their grip according to the amount of load. To complement the Race mode, Mercedes added larger front brake discs and an electronically-controlled differential. The overall design is sportier and more muscular to depict the driving performance of the AMG. The entire vehicle weighs up to 2 tonnes. The power steering and standard adaptive dampers work well, nevertheless, to ensure that there's no body roll. The sill panels attached to the sides make the car appear lower. To complete the picture, Mercedes adds two chrome-plated tailpipes for the exhaust system. 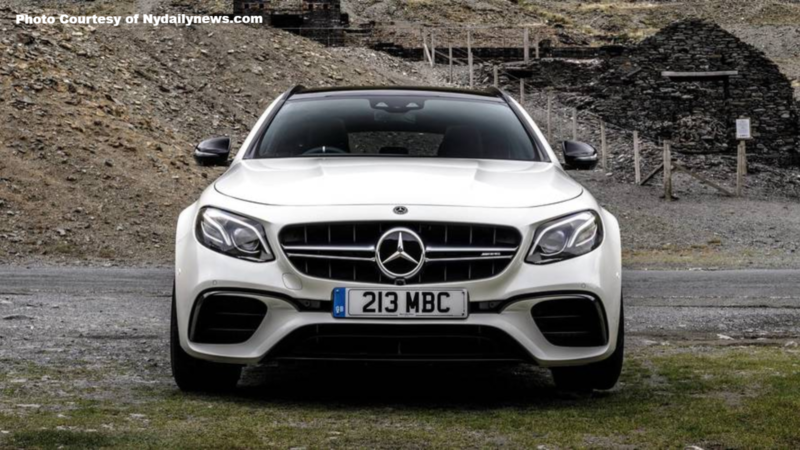 The owner for the revamped Mercedes AMG E63 S Estate didn't mention how much it cost to customize the vehicle. However, for a new Estate that churns 563 hp and 533 lb-ft of torque, the buying price is at $123,066. Mercedes-Benz asks for at least $135,907 for the variant producing 603 hp and 627 lb-ft of torque. The vehicle carries an unmistakable character with addictive performance. For those looking for a practical and extremely fast station wagon, the AMG E63 S Estate is the perfect choice.